I took this picture when I was shooting the previous episode. 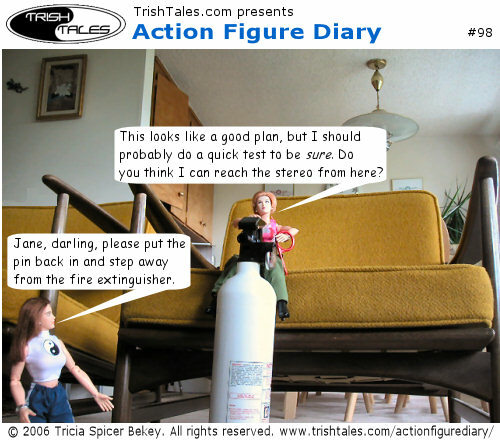 I knew that some readers were going to doubt whether Alex had a good plan for using the fire extinguisher, so I wanted to show how it would work. The fact that Jane is a little too excited about using the fire extinguisher is a bonus. SNEAK PREVIEW: Next week's episode (#99) will include the line, "And my kung fu is the best!" Lisa just doesn't understand the pleasure of going Weapons Free, does she?